Google just released two new features called “Friends Group” and “Updates” as part of a larger roll out today of new social features for users of its home page. With the Updates feature, Google lets users share their activities with other friends — and it’s thus jumping with two feet into the territorial war going on between Facebook and Twitter. Those sites have become popular, at least in part, by letting you make updates about what you’re doing. While Twitter lets you make updates of short messages, Facebook allows an update stream of your various activities — and so this move by Google is a direct challenge to Facebook. Let’s back up a second. For a while now, Google has let you create a home page called iGoogle. It lets you do things like track weather, stocks and news — anything that you’ve found useful for yourself. But until now, those activities have been limited. But all this time, Google has been working to leverage its cross-site platform protocol called OpenSocial, so that you can communicate with third-party applications from directly from your iGoogle home page. The features released today do just that. And significantly, they’re part of a wider Google initiative to add social features to all of its offerings. Recently, it has added social features to Reader (the product that lets you read, and now share RSS feeds), and has even started adding social features to search. To start with, today’s features focus on making it possible to share information with your friends from the activities you engage in on iGoogle (go here to see the first 19 social activities you can use). For example, you can share information, such as the movies you like (see the Flixster widget below in image; there’s an icon on the top right hand side which shows that the widget is “social,” in other words that you can share your rating information with your friends). A “Friends group,” also newly announced today, is a list of friends you can create based on a subset of users’ Google Contacts to be able to interact and share social gadgets with. 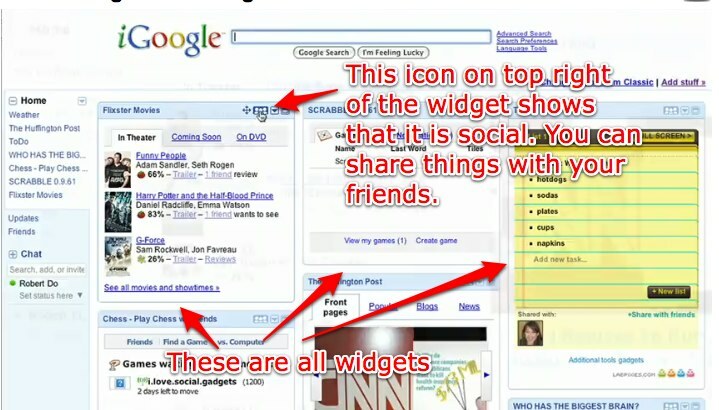 “Updates” allows you to show your friends what you are are up to when you share information from Google’s widgets (Google actually calls them “gadgets,” but everyone else calls these windows of information “widgets”). The updates let your friends see the things like photos, ratings and and other actions you take from your Google home page — and so is very similar to what Facebook offers. (Facebook, meanwhile, is making its own moves against Google and Twitter with improved search.) Likewise, you can see what your friends are doing on your updates page. See below.